Welcome to the 231st Tablescape Thursday! 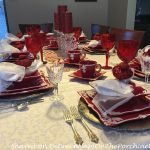 For this week’s TT, I’m excited to share two more wonderful Valentine’s Day table settings put together by my friend, Marie. Marie created these for Valentine’s Day but with just a few small changes, they would really be beautiful for any time of the year. Remember the casual eating area located in Marie’s family room? 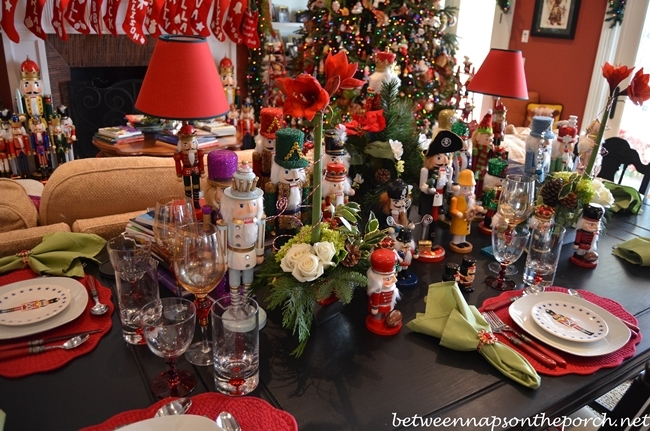 At Christmastime the table in that area was set with a whimsical nutcracker theme. With a few small changes, Marie created a whole new tablescape for this table. 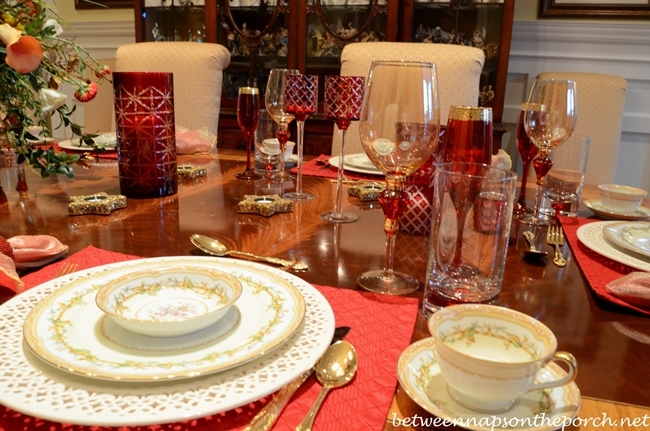 If you look closely, you’ll see Marie kept the placemats, flatware, dinner plates and napkin rings. 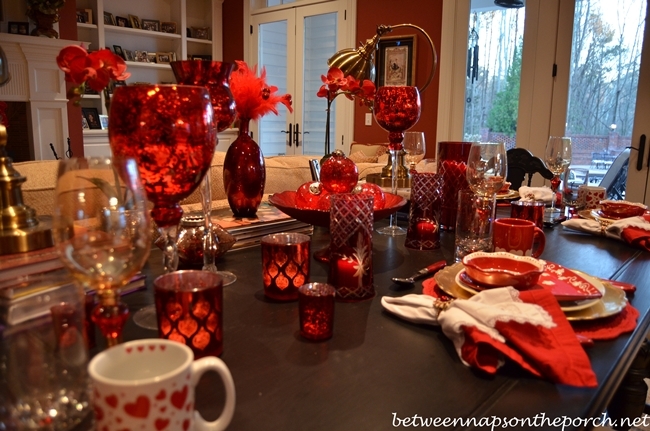 She added gold chargers for Valentine’s Day and changed out her centerpiece, salad plates, glasses and napkins. 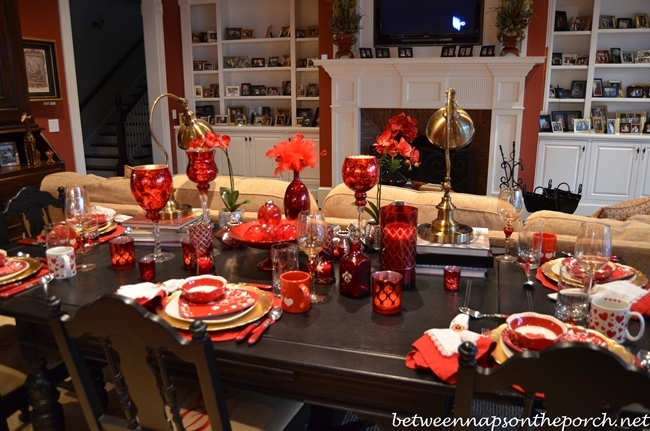 Red always works great for Christmas or Valentine’s Day settings. 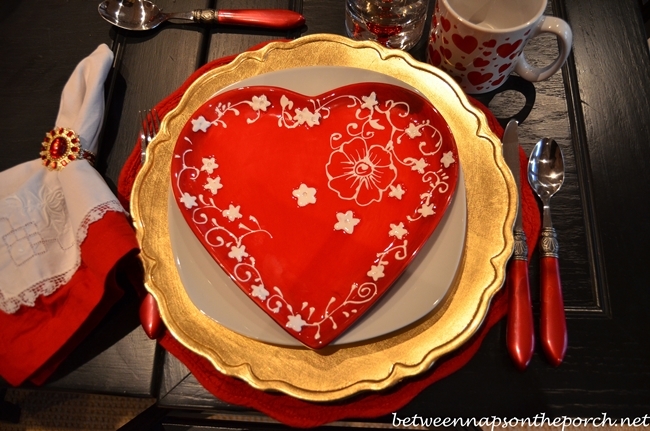 Love these wonderful red and white, heart-shaped plates! Marie also created a tablescape in her dining room using beautiful vintage china once belonging to a friend of her mother’s. You can never go wrong with a floral centerpiece. Flowers are perfect for any table setting, especially a Valentine’s Day tablescape. Love the delicate pattern on the vintage dishware in this setting. Marie has been looking for pierced chargers and she found some really pretty ones a few weeks back at Ralph Lauren dot com. The gold flatware really ties in well with the gold edges on the dishware. This table would be great for Christmas or really any time year. 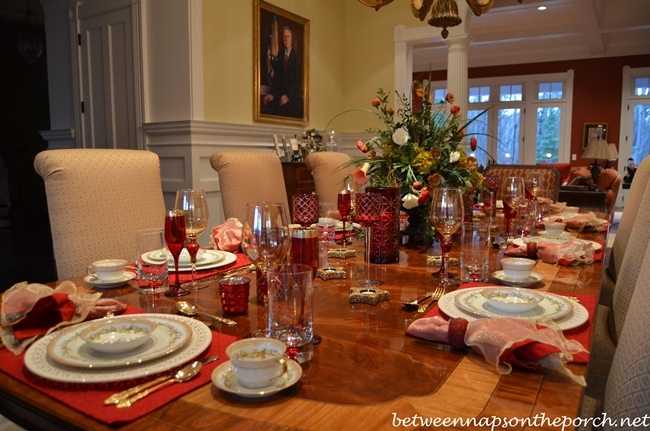 Marie, thanks so much for sharing these wonderful table settings for this week’s Tablescape Thursday! 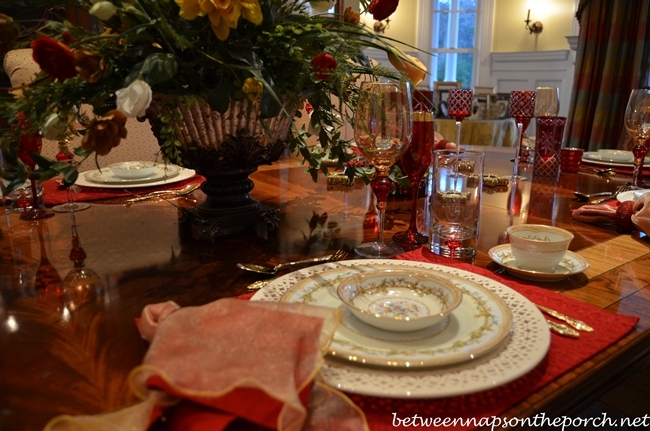 Looking forward to all the tablescapes for this Tablescape Thursday! Marie really does a fantastic job with the holiday decor and pretty tables! I would love a closer look at the beautiful pattern she used on her dining room table this week. So delicate! Does Marie have a blog? She should, as she has a lot to teach us! Both of Marie’s tables are Seasoned to their finest!!! 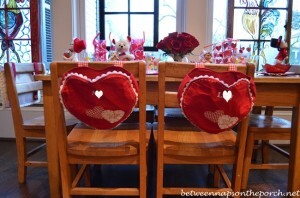 I adore the causal table set with heart shaped dinnerware!!! The reticulated chargers from Ralph Lauren are exquisite!!! 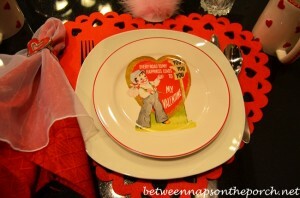 Thank you for sharing two inspiring tablescapes for Valentine’s Day, dear friend!!! 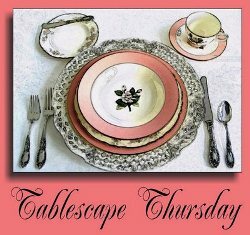 I appreciate your hosting of Tablescape Thursday each week!! Great inspirations from Between Naps On The Porch!!! The buttons to link up my tablescape post are not at the end of the story. I’ve experienced this several times before and contacted you once about it. After about an hour the link became visible. Is there something wrong with the code? Colleen, sometimes the script gets corrupted. That’s one of the reasons I can’t schedule the party for a set time each week…I have to physically be at the computer to hit “publish” because after the last WordPress update, the code will not stay as it should. I put the code in last night and “saved” the post. When I finished the post this morning and hit “publish”, the code was there but failed to work. I had to go back to InLinkz and get it again. You probably tried to link up right after I hit publish and before I had replaced it with new code again. I always check to see if the code is working but it does take a minute or two to retrieve it and add it back to the post when that happens. Very frustrating that it happens…means I can not schedule a post in advance. Mr. InLinkz created a plugin to try to fix the issue but I already have so many plugins in place that I don’t want to add another one. Often plugins don’t play well with each other so sometimes when you add a new one in, something else starts going wrong on a blog and you have to remove it. I have to just manually check it after it’s added each week. So if you stop by to link up right after the post goes up and it’s not there, refresh a minute or so later and I should have it re-added back in by then. WordPress recently came out with an update that I was hoping would fix the problem with how it corrupts the InLinkz script, but unfortunately it didn’t. Hopefully they will eventually fix that bug and I’ll be able to put the script/code in and have it stay uncorrupted. Gorgeous, gorgeous, gorgeous! I can’t say it enough. Thanks for sharing these beautiful settings. Susan, what fun it is to see all of Marie’s beautiful treasures. She must spend all of her days shopping or decorating. I cannot imagine doing this many tables for every occasion, but I love seeing hers. Thank you so much for sharing her home with us – it is so full of inspirational ideas! That Marie has some really great pieces in her stash!!! The pierced chargers are sturdy, I’m sure, but they have such a delicate look to them. I like those ruby red napkin rings, too!!! I am always inspired by Marie’s tablescapes. One of the things I came away with today is how important it is to have a neutral background if one loves to collect dishes and tableware. 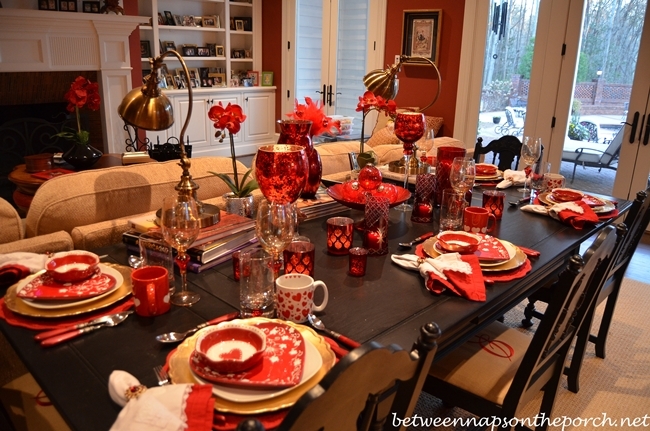 Not every “decorated” house would allow for all of the red used in these tablescapes. Thanks for hosting and sharing Marie’s beautiful home! Hey JP, Girlfriend, it’s already in there. 🙂 I think you just missed it. It’s the first sentence in the second paragraph under the “Please Read” part. Do the other sites put it in a different place? Maybe I should also add a sentence underneath the InLinkz button…maybe that would make it more noticeable. See that just proves I have ADD…I must learn to read SL-O-O-=OW-LY! 🙂 I’m guilty of the same thing. I am in love with the heart plates! OMG! 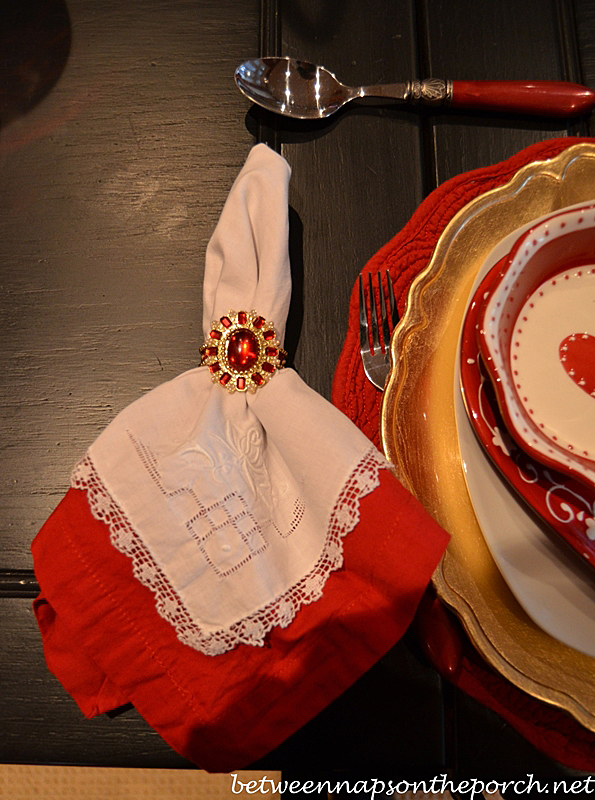 Plus the beautiful napkin ring is perfect for this Valentine setting. I really love the white pierced chargers used in the formal setting. They are so elegant looking! Thanks for sharing. As usual, you are the best! I enjoyed looking at her treasures. Being the wife of the governor, she must really be the idol not just in politics but even in her daily life. A very elegant table that I won’t hesitate to join with her if ever Marie invite me one day (even in my dreams). TY once again for the treat and the never ending inspiration and hosting. Sending you warm thoughts! I bet it is freezing there! Hello Susan, fantastic tablesettings! I am loving the inlay pattern on the table – exquisite! I am with you on plug-ins and InLinkz! Since moving to WordPress I have been very, very happy – when the ‘bug’ occurred with the update on WordPress it was somewhat disheartening – to find the scheduled party there sometimes and not. I have been publishing immediately too – Hopefully, they’ll figure this one out – it has been going on for quite a while! Always a pleasure to join your party. I know…it is a pain. InLinkz created a plugin that’s is supposed to fix it but I have so many plugins, I’m reluctant to add anymore since they don’t always work well with each other. I’ve heard it’s best to have as few plugins as you can. Thanks, Kathy! Have a fabulous weekend! Another two stunners from Marie!!! I love red and incorporate in my own home. If I were at Marie’s I would take dinner at the elegant table in the dining room and then sit at the *fun* red table for dessert. I love those heart plates and would like to know where Marie purchased them. The napkin bling rings are special. Thank you Susan for hosting and thank you Marie, once again for allowing us into your home. hi Megan, i purchased the heart plates at Home Goods this year. i love them too. The white pattern makes it look more romantic, kinda like victorian lace. 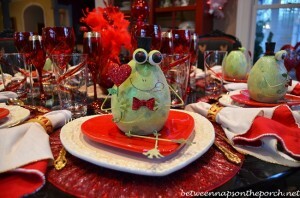 I have loved every single one of your blogs, and now that we are approaching Valentine’s Day again in 2014, the question I want to ask has been bugging me since I saw this gorgeous Valentine tablescape by Marie in 2013! I know she said that she found the heart plates at Home Goods, but I wonder if you or she could please tell me the name of the company on the back of the Heart plates, who makes them and/or the Designer’s name so that maybe all of her admirers, who might want to track them down, might be able to search for them. I would greatly appreciate this information! Best wishes to the both of you! Laura, Marie just emailed me and said the only thing on the back of the plates is 7373 and the words Made in Italy. Hi Susan! Mrs. Barnes does a fabulous job on decorating! I wish I had a small bit of her talent! What a beautiful place setting! I’m swooning with those heart dishes, they are simply gorgeous and elegant!! This entire tablescape is FABULOUS!! Thanks for sharing Susan, so much eye candy. By the way you know who I’m missing? ..your friend Cornellia! Hope to see something from her in the near future. Have a great weekend. Thank you for hosting such exciting party. Cornelia sent some pics of her Christmas tree…I just never got a chance to post them. Thank you to Marie for allowing us to visit her beautiful home and to you, Susan, for sharing her wonderful tables and decorations. I, too, LOVE the red, heart dishes and would love to know where she found them. They’re gorgeous! I know every guest to her home feels so special because she creates a beautiful, inviting atmosphere and it shows that she cares. I always look forward to your blog and especially on Thursdays. Marie’s home is absolutely beautiful and she does such an amazing job of decorating. This inspires me more than I can say. I have learned so much about tablescapes and love, love, love this. Thank you for posting your blog each day. I am a very faithful follower. Thank you for hosting this lovely party. 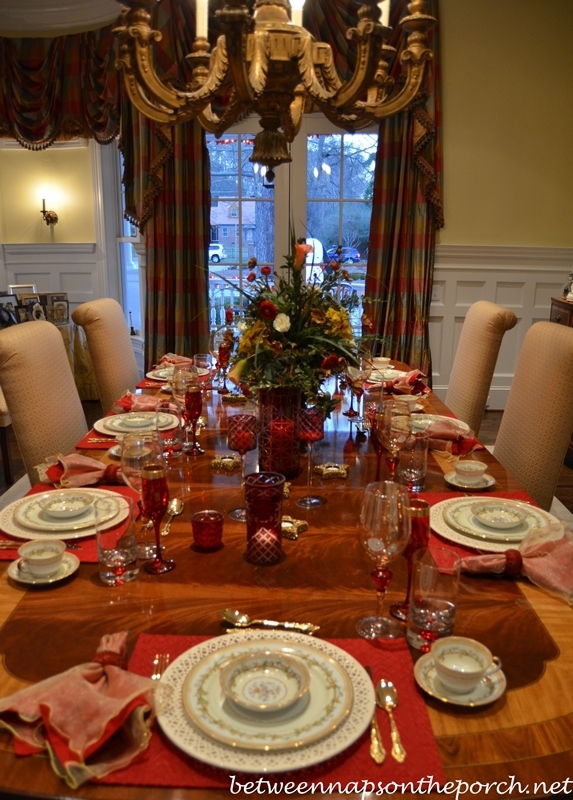 I just love seeing all of the red dishes and tablescapes..
Beautiful table Susan. Love it! Thanks for hosting. How fun to see all the tabletop inspirations. Marie’s tables are all so lovely. Thanks for sharing! 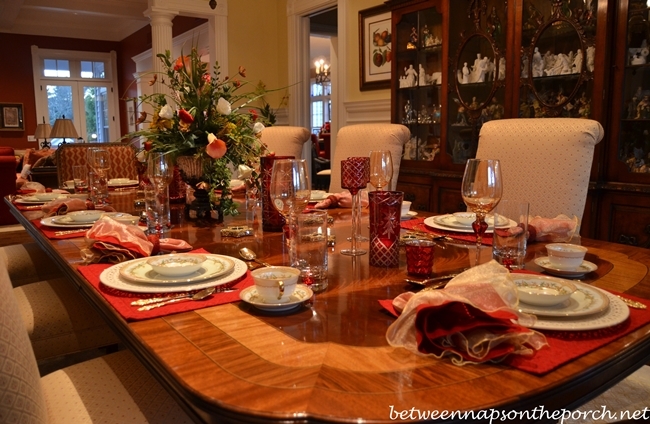 Marie’s tablescapes are exquisite and fun….she so remarkable!….Thanks for sharing her beautiful dining areas with us Susan…I so enjoy seeing Marie’s beautiful home and her seasonal displays!….such a treat!…and hopefully will be seeing more in the future!….Have a great weekend Susan and hope that your critter problem is solved! What a gorgeous tablescape! Those red heart plates atop the golden color are striking. Thanks for hosting! As with others, Marie’s red & white heart shaped plates are my favorite thing here. Checked above posts & saw where Marie found them at Home Goods this year. Oh how I wish we had a Home Goods near us…altho that would probably get me in a lot more “trouble” than I’m already managing to get into. Your posts are just so great & our tastes seem very much alike. Stopping by to visit with you daily is a joy!